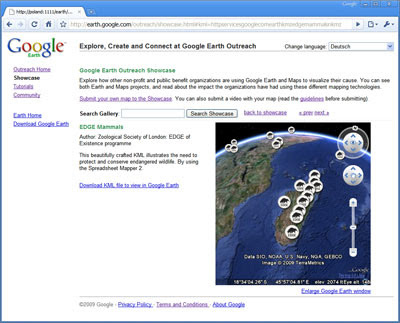 With our newly re-designed website, Google Earth Outreach can help more than ever. 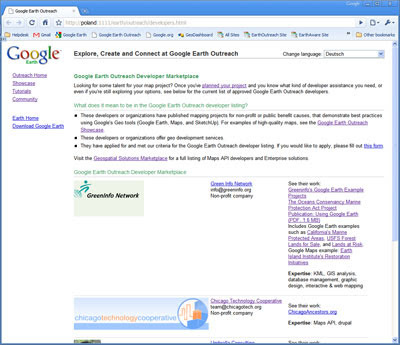 Our new showcase, tutorials, and community give non-profit and public benefit organizations the ability to explore, create, and connect at Google Earth Outreach. Explore non-profit and public benefit maps with our new Showcase, where you can interact with Google Earth and Maps projects right from within the webpage. We've added Maps API and Earth API applications, as well as My Maps. You can also visit in-depth case studies for several projects from the Showcase. Some case studies, like Appalachian Voices and Clean Up the World, contain new videos about how the organization used maps to change the world. Create maps with our enhanced Tutorials section, which includes seven new Google Earth tutorials, such as how to create a tour and embed it on your website. All of the new tutorials have videos to watch before you get started. You can also plan your project before you dive into your mapping work. Also new is a list of Tools and Resources that will help you create your maps. Connect with other non-profits at our new Community & Grants section, which contains many different opportunities for non-profits. If you're an eligible non-profit, you can apply for Google Maps & Earth software grants, including Google Earth Pro, SketchUp Pro, and now Maps API Premier. In our new Developer Marketplace , you can find a list of programmers and developers with experience in public benefit mapping to help with your project. Finally, you can sign up for our quarterly newsletter where you can learn about new updates, upcoming trainings, and more! Visit our new Earth Outreach website today at http://earth.google.com/outreach. You want to change the world. We want to help.